The picture above illustrates which of the following parts of the skeletal system? Check all that apply. (A), (C), and (D) are all correct. The tendon, which attaches muscle to bone, does not show in the picture. 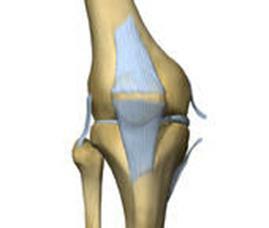 The white connective tissue holding bones of the knee together is called a ligament.